For my first read of the new year, I decided to jump in with a book that's received rave reviews and won a couple of awards to boot, The Seven Deaths of Evelyn Hardcastle by Stuart Turton. The blurb instantly grabbed my attention and I was sure I was going to be in for a wild ride with this book, it certainly did not disappoint! Each day, Aiden Bishop wakes up in a new host, but his task remains the same, discover who killed Evelyn Hardcastle. He has eight hosts and eight days to try and solve the mystery, if he fails the loop starts again from the beginning. Aside from wanting to solve the murder, Aiden is also desperate to know how he ended up at Blackheath, why is someone intent on killing him? Why does he feel drawn to a woman who is also trying to escape and what is Blackheath really hiding? With more twists and turns, you're guaranteed to never be bored by this novel. Due to the amount of characters and they way each small event impacts the story though, this is definitely a book you really have to concentrate on. I was seriously impressed by this novel, it was extremely clever with a hint of Black Mirror dystopia to it. I spent so long trying to solve the murder alongside the protagonist that I definitely didn't see the ending coming, it was so full of surprises, I loved it! 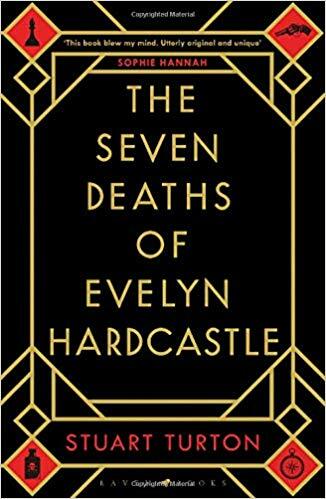 The Seven Deaths of Evelyn Hardcastle was a fantastic book to kick of a new year of reading and I highly recommend giving it a go for yourself.